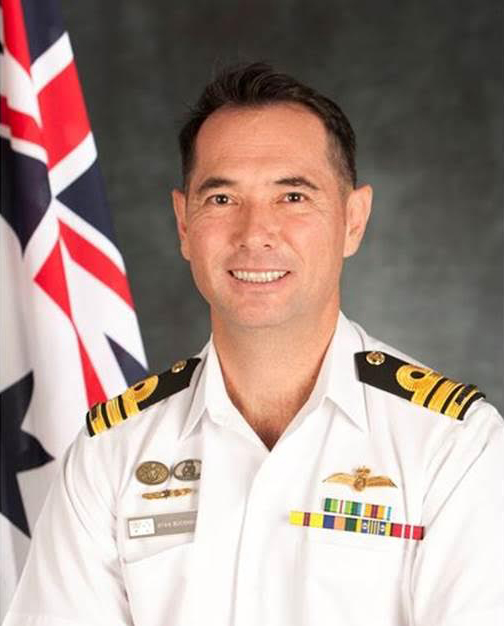 Commander Stan Buckham joined the RAN in 1991 as a Maritime Warfare Officer, and completed ADFA in 1993. After attaining Bridge Watchkeeping Certificates in Major Fleet Units, he spent time at Fleet Headquarters as Duty Fleet Operations Officer before transferring to Aviation Warfare Officer and completing Basic AVWO Course at RAAF East Sale. He then posted to HMAS Albatross for rotary conversion and operational flying training at 816 Squadron. Since 2001, Commander Buckham has conducted a number of operational Flight deployments to Operations RELEX, CATALYST, and SLIPPER. He has also been posted to the School of Air Warfare and 816 Squadron, Fleet Aviation and Sea Training Group at FHQ, CASG as the AIR9000 Phase 7 HATS Operations Manager and HQ-FAA as Commander Aviation Development. Prior to taking post as Commanding Officer 725 Squadron, Commander Buckham served as Director Training Authority Aviation. Commander Buckham holds a Masters in Maritime Studies, Bachelor of Science Degree, Graduate Diploma in Defence Studies and a Certificate IV in Training and Assessment. He has completed courses such as Aviation Warfare Instructor, Force Warfare Officer, Flight Commander and Australian Command and Staff Course. Commander Buckham assumed command of 725 Squadron in January 2018.